I bought the Kestral and Mantis. Still waiting on the mantis. I decided to try this route because of some neck and back surgeries. I cant carry the weight of a tree stand and my filming gear anymore. The Mantis weighs only 18oz. That sure beats 21lbs for my lone wolf climber. This past Sat I hunted bear for four hrs. out of the saddle while filming for a young buck from work. It was awesome. no discomfort whatsoever. I just want to hear from somebody who's done an all day sit during the rut with one these things. 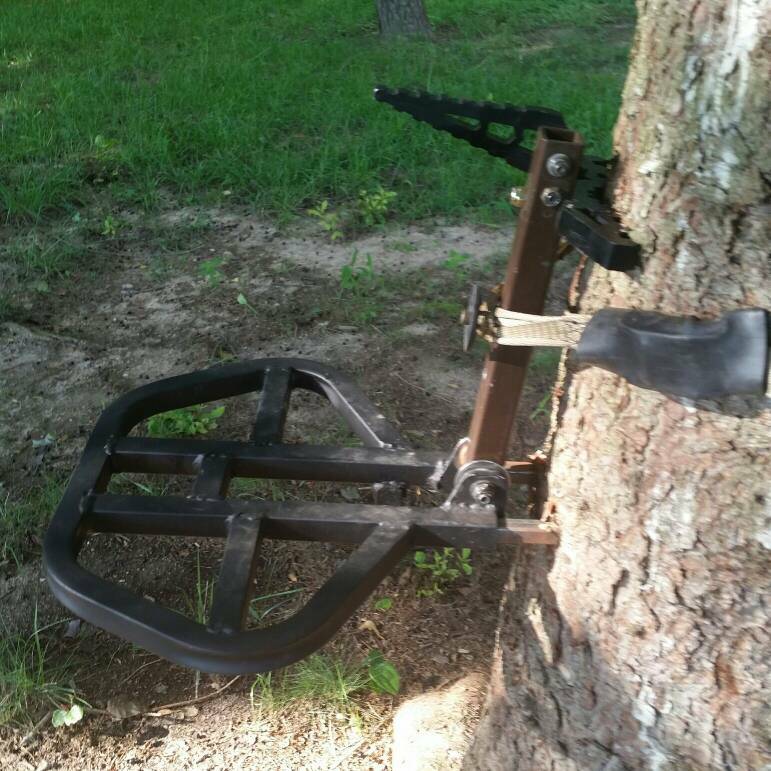 I climb trees for a living, and I spend a lot of time in a saddle, but I would not even consider one for hunting. There's too many variables. I'll stick with my LW. I have. There is no more discomfort then hunting from a stand. I would always need to stand once and awhile doing all sits on a lock on. It's the same with the saddle. Every couple hours I go from sitting position to a leaning position. I did 5 hour the other night just leaning and only had mild hip pinch the next day. But that's normal for the first few sits of the season no matter what I'm hunting from. There is night and day difference between a hunting saddle and arborsite saddle. You should try one sometime since you are a climber, you might be surprised how much you will like it. If you wanted to try mine one day, I'm only 30 minutes south of Philly. Thanks for the offer Holt, but this old dog ain't learning any new tricks. Seriously though, I would feel too restricted in one. And being a climber, I have an understanding of the concept, but I just don't see much advantage to it. As far as being able to shift to shoot behind the tree, that movement's going to get a guy busted most of the time. To each his/her own. I understand that. One big advantage is the weight. My entire setup is probably around 10 lbs. Including harness, platform, and climbing stick. My saddle weights less then alot of tree harness alone. The first time you have a long hike in and have to setup, that's where there is a big difference. Takes me maybe 5 minutes. I'm not trying to convince you, just throwing info out for anyone else reading. And the offer is always open if you want to try it one day! early in and SheddingLightTravis like this. So, I've been researching this style of hunting for my future public land hunts. Q1: What if you need to add layers for warmth or change socks? Obviously, the #1 tip of public land hunters is to "go where no one else goes", so I will need to cool down, then add layers. I may end up going with sticks/lock-on, but this seems like an easy idea to get into some crappy locations. I’ve been researching this too and intend to purchase a saddle this offseason. I’ve been looking for used ones too but they are few and far between. I’m thinking the mantis with platform is the way I’ll go at present. You can add any layers while in the tree. Pants or bibs are the hardest to do. You have to Un buckle the waist strap to put on pants, but every thing else is just like a lockon. I usually put my bibs on at base of tree before I climb. Then while setup I will put on my jacket once I cool off. What are you using for foot placement to move around tree when the shot presents itself? I built a small platform out of seat and a 12" piece of a lone wolf stick. It's pretty much a really tiny lock on stand. Only weighs a few pounds. They do sell pre made ones, But hard to find this time of year. It would be worth your time to meet up with someone that already hunts this way and try there setup. Your type of hunting would be perfect for this. I hunt different tree and area every sit, and almost any tree I can climb. More limbs the better! What brand saddle do you have? Dude the last 2 years I have done a couple public land hunts with friends and laugh with all the gear and stand that they have to bring in. I wear my harness and everything else fits in or on my small back pack. It so nice! A couple days I walked 3 plus hours before setting up. Never know you have your whole hunting system on your back. Don't know how close you get to MD these day, but if your up this way and want to meet and try it out, let me know. Oly44 and virginiashadow like this. Ty for all the info buddy. I'm going to buy one this off season.